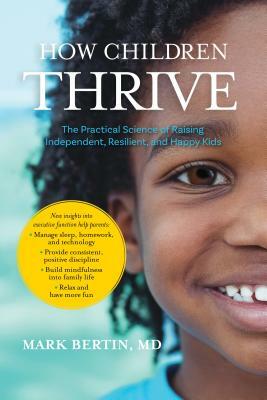 How do children thrive? As a parent, you probably think about this all the time. You want your children to have happy, healthy, and meaningful lives--but what's the best way to support them? In How Children Thrive, developmental pediatrician and parent Dr. Mark Bertin provides a positive, simple, and empowering approach for raising children of all ages. Bringing together mindfulness, new science on brain development, and the messy reality of being a parent, Dr. Bertin has a created a breakthrough guide that will help children--and their parents--flourish. Technology--how much is too much? At what age is screen time OK? Help your kids have a healthy relationship with media. "The pressure to be the perfect parent is overwhelming," writes Dr. Bertin, "but the truth is the job is too challenging and varied to ever be done to perfection." With compassion and reassurance, Dr. Bertin presents a relaxed, instinctual, and evidence-based approach to raising children who thrive. Mark BertinMark Bertin, MD, is a developmental pediatrician and author. His previous books, Mindful Parenting for ADHD and The Family ADHD Solution, integrate mindfulness with other evidence-based ADHD care. He is also a contributing author for the book Teaching Mindfulness Skills to Kids and Teens. Dr. Bertin is a faculty member at New York Medical College and the Windward Teacher Training Institute, and is on the advisory boards for the nonprofit organizations Common Sense Media and Reach Out and Read. His blog is available through HuffPost, Mindful magazine, Mindful.org, and Psychology Today. For more information, please visit his website at developmentaldoctor.com.Christopher WillardCHRISTOPHER WILLARD, PSYD, is a clinical psychologist and consultant specializing in bringing mindfulness into education and psychotherapy. The author of Child's Mind (Parallax, 2010) and other books on the topic, Dr. Willard lives in Cambridge, Massachusetts and teaches at Harvard Medical School and Lesley University. For more, visit drchristopherwillard.com.